There were rumors, however tenuous, linking the Packers to several of the running backs in free agency, but (so far at least) the team has come up empty. That leaves Jones and Jamaal Williams as the lead dogs in the Green Bay backfield, and while the team has been wildly reluctant to give Jones the full workload thus far, there’s little reason left not to default to him over Williams in 2019. Jones first topped 40 offensive snaps in a game in Week 9 and stayed at 39 or above the rest of the year until he got injured early in Week 15. So from Week 9 to Week 14, Jones had 446 rushing yards (fourth in the league), six rushing touchdowns (tied for second) and 123.1 PPR points (RB4). If the Packers strike out in adding another option this offseason, he has sky-high potential. Cook’s career would have been so different to this point if he had just stayed healthy. (Yes, that’s true of every player who gets hurt, just making a point.) He was RB9 and had the fourth-highest PFF rushing grade through Week 4, including the week he got hurt, with the third-most rushing yards in the league. He took a while to get healthy in 2018, but from Week 12 to the end of the year, he was the third-graded back and No. 6 in fantasy points. In those 10 games of admittedly arbitrary endpoints, Cook averaged 17.5 PPR points per game, which would equate to 280 points over 16 games, or RB7 in 2018. Now even further removed from injury and with Latavius Murray out of town, Cook should get an even greater share of the carries, giving him an extreme ceiling. The Lions appear to have made a full commitment to a run-heavy offense this offseason, bringing in Darrell Bevell as offensive coordinator. And unless the Lions want to go with heavy Zach Zenner use in 2019, the list of ball-carriers in that backfield pretty much starts and ends with Johnson, now that LeGarrette Blount is a free agent and Theo Riddick remains basically only a pass-catcher. 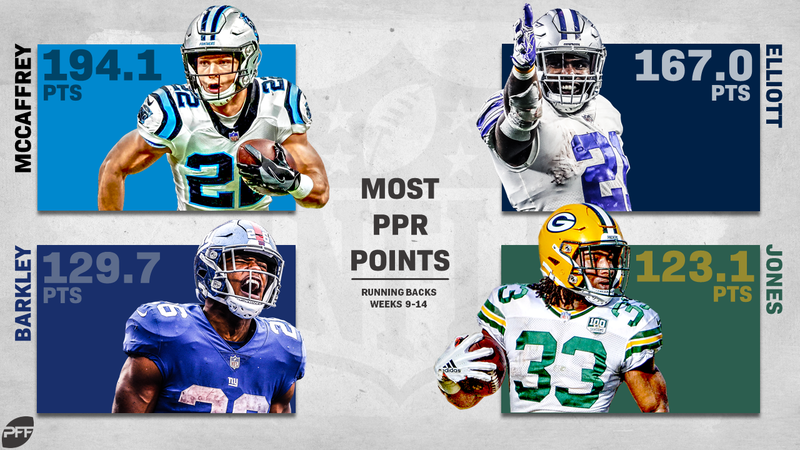 Detroit took a while to lean on Johnson as a rookie last year, but from the team’s bye until his season-ending injury, over five games, Johnson was the PPR RB9, averaging 17.4 points per game. A rush-heavy Lions offense anchored by Kerryon Johnson could produce a best ball monster. Foreman’s last game before his rookie 2017 ended featured 65 yards and two touchdowns, as backfield-mate Lamar Miller continued to disappoint in his Houston tenure. The torn Achilles cost Foreman the rest of 2017 and, for all intents and purposes, all of 2018, but almost two years removed from the injury entering the 2019 season, he is a candidate to unseat Miller as the Texans’ RB1 if the team doesn’t make any backfield additions between now and then. That’s really the main thing working in Foreman’s favor, but getting a potential starting running back in a Deshaun Watson offense at RB51 (his current ADP) is a possible steal. Johnson’s fantasy value has gone through the floor since the signing of Kareem Hunt, but it’s a reasonable question of whether it should have, considering the potential of a lengthy Hunt suspension. We don’t know how much of the season Hunt will be available, if any, and in the interim Johnson is the only real pass-catching option the Browns have out of the backfield — Nick Chubb didn’t even average two targets a game as a rookie and had a total 31 receptions in four years in college. And if Hunt is available for most or all of the season, it’s hard to see Johnson even remaining on the roster, which would likely mean a trade to somewhere else where he can be a third-down/pass-catching back as well. Either way, Johnson should be one of the top pass-catching backfield options around the league, and we know that receiving always has value. 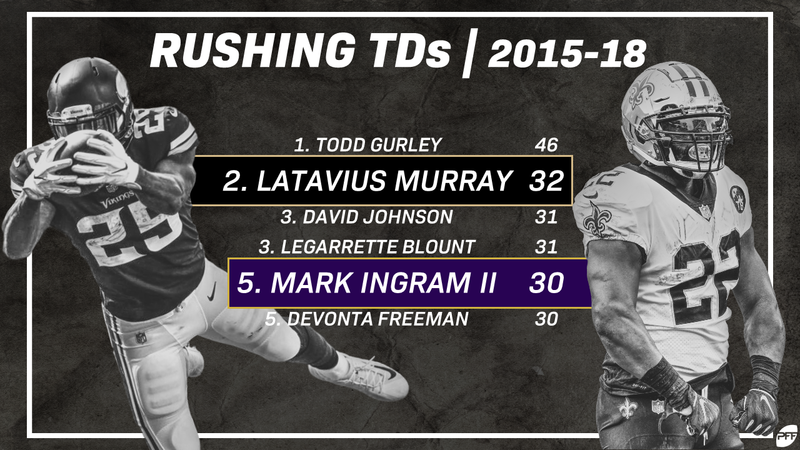 Something you probably didn’t know unless you follow our Pat Thorman on Twitter: Over the last four seasons, only Todd Gurley (46) has more rushing touchdowns than Murray’s 32. He’s almost never been his team’s first choice, but he’s still gotten the work, and is fourth in the league in rushes inside the 10 over that span with 78. In fifth place in that stat? The man he’s replacing in New Orleans, Mark Ingram. Alvin Kamara hasn’t been a slouch in that regard, either, but considering the Saints are just about lapping the field in running back fantasy points over the last whatever timeframe you choose to employ, there is enough to go around. Murray will have plenty of games where he does almost nothing, but his touchdown skills should give him plenty of best ball value.